An alternative to strip-lighting and counterfeit food: a locally based choice of very good groceries. At Barney, just off the A148, we raise organic beef, lamb and a flock of garrulous French chickens. For Christmas, numbers swell with turkeys and geese. We sow every kind of vegetable in our organic garden and have most fruits too. Amongst our stock, you'll find the beers of hard-working local brewers, pickles, conserves, jam, a range of organic wine for all pockets, fresh bread and pastries, artisan and wild food. Come first thing any day - we open all seven of them - for coffee and home-baked cake and the chances are you'll meet one of the local producers dropping off goods. 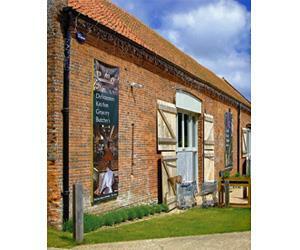 In the evening there could be a private party going on in the oak-beamed barn, a book launch or an exhibition. If you're in a hurry, ring through an order or use our website to pre-order, or choose a gift to be sent on your behalf. If chopping and washing, grilling and baking are not what you want to do, buy one of our meals. Embankment Beef with Yetman's Stout, for example, named after the long-gone railway line, now covered in vetches, harebells and grass, where the sheep and cattle roam. Like other farm shop owners, Veronica and I wanted to get back to farming on a human scale. Growing for friends and neighbours, knowing that the animals are not ending up under the lights of a supermarket shelf miles away, and that the vegetables are being tasted at their best, is a reward in itself. Two miles south of Holt on Fakenham Road.